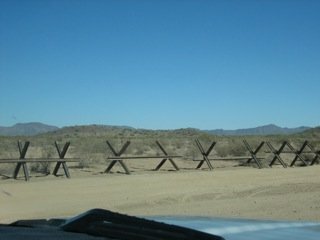 These Normandy-style barriers just ten feet from the Mexico border were erected by the National Park Service to block border patrol vehicles from pursuing illegal aliens into the Organ Pipe Cactus National Monument. Agents are allowed to pursue on horseback, but only if the animal's diet consists of weed-free feed so that its feces cannot harm the ecosystem. The sonoran desert may be one of the most beautiful deserts in the world. Once you've lived there, as I have, and grown to love it, you are not particularly fond of the way the border patrol has torn it up with their off-road vehicles and atvs. And most of this increased presence has to do with keeping us all safe from marijuana, not the harder drugs. This is one citizen who resents that his tax dollars are continuing to be used in fighting a "war on drugs", a war that we can never win, as long as the american public has the appetite that it does. Legalize it, tax it, and we'll put the cartels out of business, and at least reduce the violence. Oh, but then we'll be eliminating a source of wealth that is certainly reaching "respectable" bank accounts on both sides of the border.